I have really enjoyed the sugar snap peas this spring. I have never really grown them before (OK, I have never grown them successfully) and was so pleased to find that we had a crop of big, fat peas with crisp, edible pods. In the morning before breakfast, which is usually when I am out in the garden, I pop them in my mouth and munch while watering and weeding. This morning, however, was different. With the onset of hot weather, the peas had all but stopped flowering. Being a cool weather crop, I knew they were just about finished. So E. and I got out the snips and clipped every pea vine. 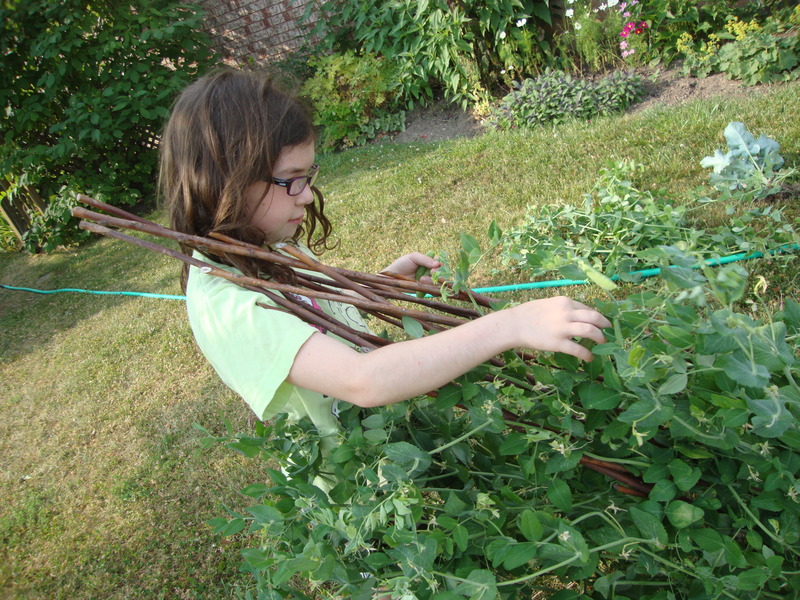 We took them off the lovely wooden trellis bit by bit, scouring the leaves for every last pea. We ate almost all of them, except that my sweet little girl insisted we keep a few for her siblings who were still asleep. I felt a little sad taking down that three-sided support, since it gave the garden height and texture. It had been there since the very beginning, too. 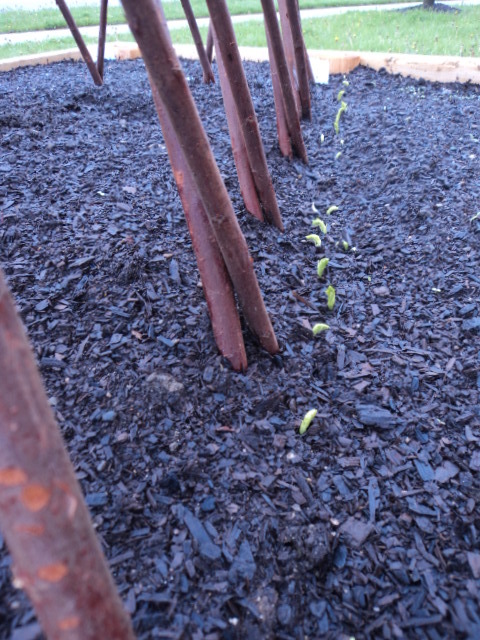 The peas were one of the very first things I planted when my new beds were created in May and their sprouts were some of the first to emerge. Things are constantly changing in the garden. 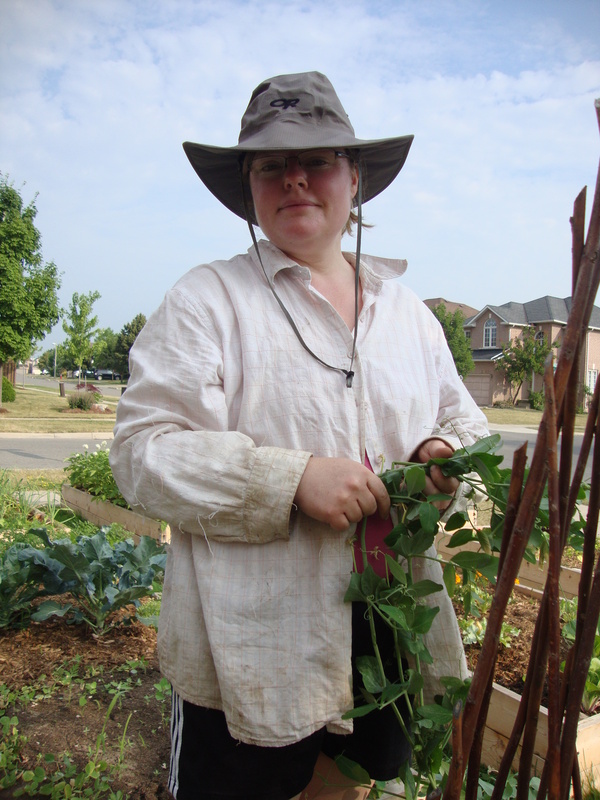 No matter what is growing–vegetables, flowers, shrubs, trees–there is always movement. Sometimes it is seasonal change as flowers and crops come and go. There is also the regular, yearly growth of those plants that have a long life. Death is a regular feature of any garden as plants succumb to drought, disease or frost. Yes, change is constant. Change is part of what makes gardening such a challenge. If you plant a yard full of large perennials and mature shrubs, only a year or two later they are overcrowded and wild looking. Planting for future growth, with lots of room for everything to expand and fill the garden beds, though, will mean at least a year or two of things looking rather sparse. There is no such thing as a garden that is frozen in place, looking perfect and exactly the right size and shape year after year after year. Our lives are no different. We get older. Our children grow up. Hemlines go up, and down, and up again. Skinny saplings planted on the boulevard become towering maples in what seems like only a few years. The shoe store at the mall is replaced by an electronics business. Vinyl turns into tapes, then CD’s, now iTunes. All around us there are signs of growth, decay, transition and transformation. This is the world God set in motion. As for my peas, there will be a bare patch now that they are finished producing. It won’t last. In the next day or two I will add some fertilizer to that spot and plant some more summer vegetables. I happen to have a few tomatoes languishing in pots on the deck who might appreciate a home. Hopefully, they will fill out the space nicely and things will be different, but still good. I will miss eating my peas for breakfast–nibbling on Swiss Chard just isn’t the same. Still, change isn’t necessarily a bad thing. For everything there is a season, after all. This entry was posted in Uncategorized and tagged garden, gardening, life, vegetable. Bookmark the permalink. Ha ha ha! Yes, and cucumbers!